Joint supply occurs when two goods are produced together from the same origin / raw material. If you grow wheat, you get both wheat and straw. If you decrease the supply sheep, there will be a fall in both mutton and wool. If you increase supply of petrol, you will get other byproducts of refining oil, such as butane. The diagram on the left represents the supply of beef. If there is increase in demand for beef, then supply of beef will rise. 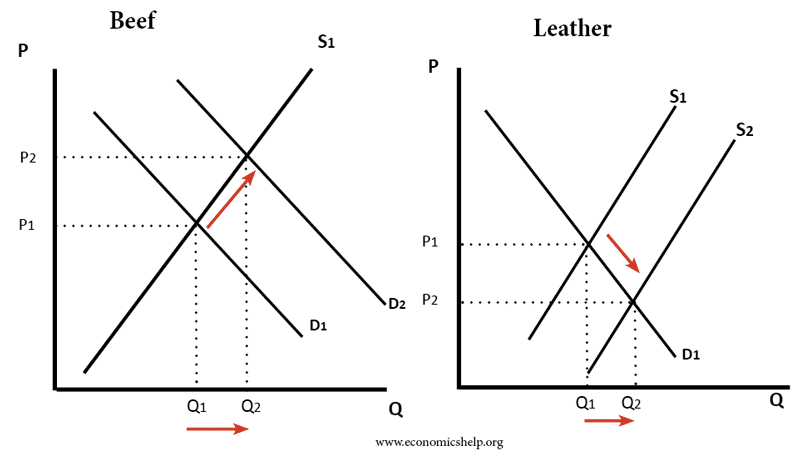 With more cows in production, there will be also a shift to the right in the supply of leather. Joint supply usually arises because producing a good, creates a by product. Refining oil, created gasoline (petrol) as by-product – with advent of petrol engine, the by-product became more desirable than the initial product of kerosene. “We may now pass to consider the case of joint products: i.e. of things which cannot easily be produced separately; but are joined in a common origin, and may therefore be said to have a joint supply, such as beef and hides, or wheat and straw. Marshall, Alfred. Principles of Economics (1890) Book five, chapter six.